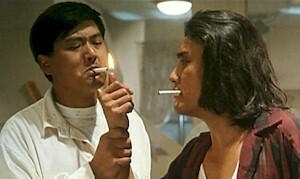 The Skinny: Chow Yun-Fat makes a long-awaited return to one of his signature roles. While not as surprising or clever as the first film, this sequel is entertaining and good fun. After five years and (presumably) numerous phone calls, Wong Jing corralled Chow Yun-Fat back for one of his best roles: Ko Chun, the God of Gamblers. In this long-awaited sequel, Ko Chun is now living in France with his pregnant wife (Cheung Man). However, the usual evil bad guys show up led by Wu Xing-Guo, and (spoiler ahead!) they challenge Ko Chun by killing his wife and leaving her unborn fetus in a jar. And that’s just in the first ten minutes. Naturally, Ko seeks revenge, but only after a year has passed. While vacationing in Taiwan, he hooks up with kung-fu kid Xie Miao after Miao’s dad Blacky Ko Sau-Leung bites it. Then more stars hop on board, including Tony Leung Ka-Fai, Wu Chien-Lien (of Eat Drink Man Woman fame), and Chingmy Yau as a Taiwanese femme fatale. They band together to take down Wu Xing-Guo, who’s become even more menacing in that buzz cut, sneering kind of way. And there's lots of hijinks and silly gags courtesy of Wong Jing.